Version: 12.2+ This applies to openSUSE 12.2 and later. Warning: Do not try to apply procedures found on the internet for other distributions to convert the images into bootable sticks (unetbootin). Doing that will break the images. 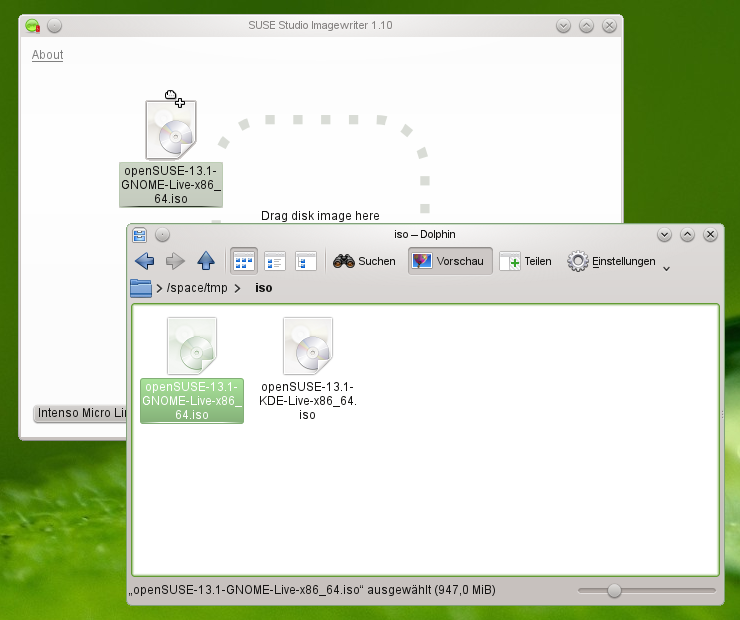 The openSUSE images are already prepared for being used directly on usb sticks, and can persist filesystem changes without further steps. Or you can use this command as a root to install Imagewriter. 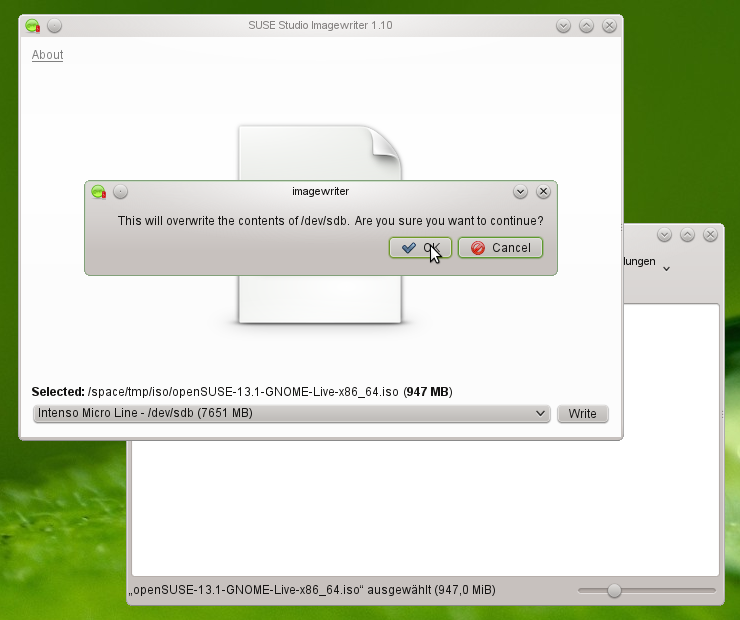 Start SUSE Studio Imagewriter from the start menu. 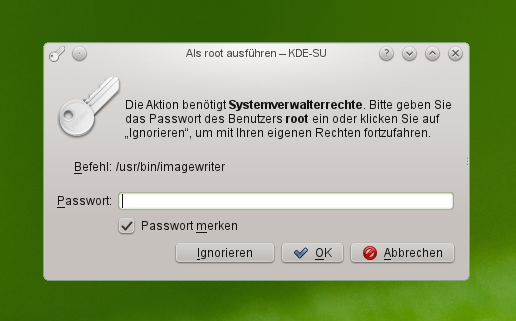 The image writer needs root permissions. So enter the password for root when prompted. Open a file manager application. Navigate in the file manager to the downloaded ISO file. Drag&Drop it to the Imagewriter. Plug your USB memory device in your computer. Select it from the dropdown menu at the bottom corner of Imagewriter. Confirm overwriting your data on the USB device by clicking OK. Writing the data takes a few minutes. 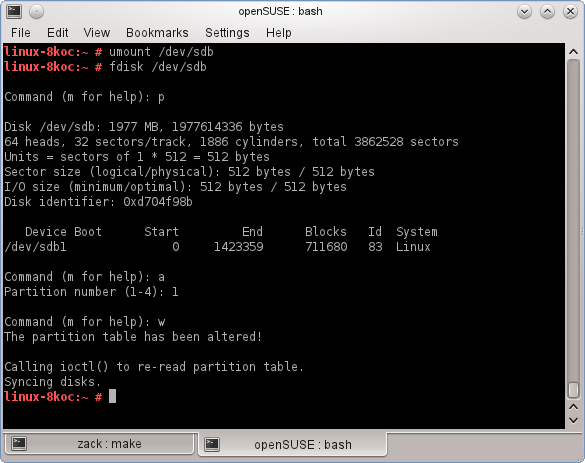 After that your openSUSE bootable USB device is ready! If you'd rather not reformat the USB device and keep the ability of putting files on it and accessible by other operating systems, you have the option of using the live-fat-stick or live-fat-stick scripts from command line or live-usb-gui point and click graphical interface. You can put ISO on vfat partitioned USB stick or hard disk. On openSUSE you can install the packages via 1-click from here live-fat-stick, live-grub-stick and live-usb-gui, if you are running any other distribution, get the scripts from here and make it executable(as root, with chmod +x /usr/bin/live-fat-stick) after copying it to /usr/bin/, make sure you have syslinux and gpart installed before running it. 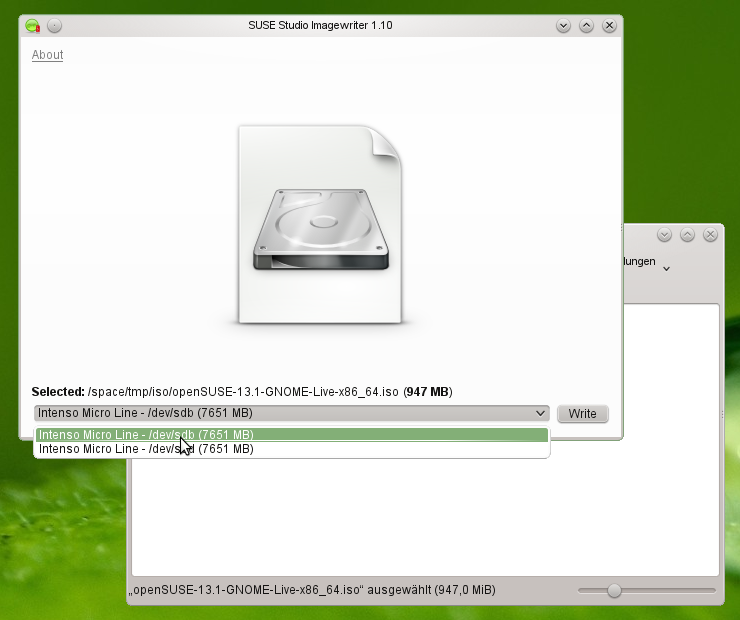 Use live-grub-stick command in place of live-fat-stick as shown in above examples if you wish to create bootable usb sticks formatted in any file systems supported by grub2, for example you can use ext3/ntfs formatted stick to create bootable USB from standard openSUSE installation iso, this allows the use of remaining space for putting other iso images or data. Multiple iso images from multiple distributions can be added to the USB device with vfat partition when not using "isohybrid" option, boot menu will offer a choice of distribution to boot from. Scripts does not format or remove data from the device. 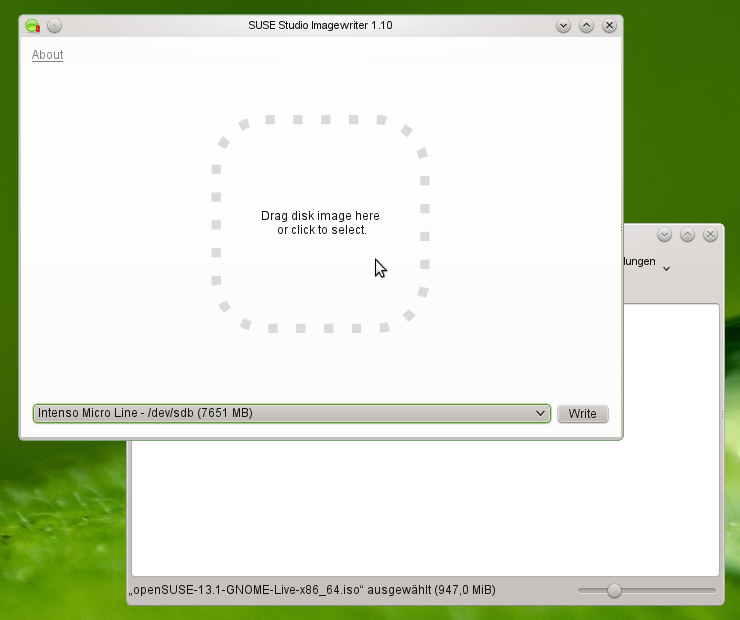 Download the installation image of your choice from http://software.opensuse.org/. Finally, once you've found your block device, write the image to it. Point 'dd' to the full path such as '/home/user/Downloads/openSUSE-13.2-GNOME-Live-x86_64.iso' or change directory (example: cd ./Downloads) to where the image is contained. your dd version does not support the status=progress option and therefore you have to remove it (and you will miss the writing progress indicator). After system installation, you may want to reuse the stick as you would normally to write things on it. In that case you have to reformat it. Often people complain that Windows fails to do it. This last step is necessary, particularly the -n SOME_NAME, or the USB stick will mount with the iso name. And done. Or, you could use gparted for partitioning and formatting. WARNING: GPT (GUID Partition Table) detected on '/dev/sdX'! The util fdisk doesn't support GPT. Use GNU Parted. Notice: all these instructions assume the stick device is /dev/sdX. You have to find which is yours (see “Find Block Device” section above). An error here will destroy some other disk in your system. That destroys the boot sector, partition table, and initial structures. Any operating system should be happy to reformat it again. This situation would happen very rarely, but in the event that your computer doesn't boot from the LiveUSB/DVD from the steps above, you might try the following procedure.